Congratulations to Karl Wadensten and Linda Kleineberg on the one-year anniversary of The Lean Nation on radio 790 AM in Providence RI. Every day Karl interviews lean leaders from his informal and hands-on perspective. Karl has not only led an impressive lean journey at his own company, VIBCO, but has brought company presidents, politicians, and all types of folks into VIBCO events to see lean in action. Karl will be broadcasting the show from the AME Conference in Baltimore November 16,17, and 18th, plus telling his story on Wednesday, Nov 17, at 10:30. On their anniversary show, Karl and Linda said that what surprised them both about taking a chunk of their time every day to do the broadcast is how much they learned by engaging with their guests and their call-in listeners. If you can't listen in, there are a number of podcasts on the Lean Nation website. Also check out K-Dubs Lean Nation Radio Show on Facebook. I bought the book when it first came out but only skimmed it. Then I had the chance to meet its author, Mike Rother, at the IQPC Process Excellence Leaders meeting in Chicago in September, and to be part of the audience for his keynote address. My friend Mark Rosenthal called it the best book on Toyota in -- did he say a long time, or in all time? 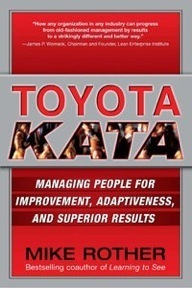 Regardless, it's one of those books that takes several readings to begin to get the depth of what a "kata" is at Toyota and why it is at the heart of an organization focused on long term survival and the development of capable employees. Mike also is publishing a website that enlarges the book's message and places the ideas in varying contexts. I think the website is essential for getting Mike's full message. Mike is conducting courses and workshops on Toyota Kata. 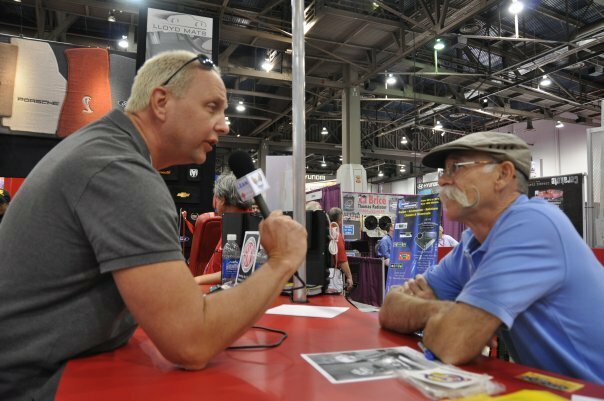 He and Bill Constantino will do a workshop at the AME Conference Nov 15. In The Remedy, Pascal Dennis continues his story begun in Andy and Me of Tom Papas and his lean journey at a fictional auto manufacturer. Now Tom has been asked to fill the role of Shusa (roughly translated as "chief engineer") for a new vehicle. In this role, Tom seeks to connect the silos of design, manufacturing, supply chain, and so on. He fights the battles most of you are completely familiar with. Being fictional characters, Tom and his crew prevail. The book covers a broad scope thinly, where it would take 10 - 15 excellent books to explain properly. That's its value and drawback. Overall, it's a good introduction to beginning to spread lean thinking in the extended enterprise. It's not enough, but I think Pascal knows that it's just starting lines of thinking that can be continued through reading his carefully chosen references at the end. It resonates with Toyota Kata in many ways, particularly in the principles of solving small problems continuously by building capability into the people in the organization, articulated well by Steven Spear in The High Velocity Edge (a better title than the earlier one - Chasing the Rabbit - read my review.) The three books read together would be an education right there. 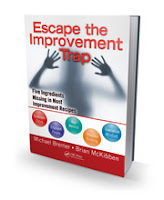 This new book by Michael Bremer and Brian McKibben is a fresh look at what happens in the real world, where most organizations that try to implement some "transformational" method eventually get stuck and call it a failure. The missing "ingredients," described in Escape the Improvement Trap are customer focus, engaged people, key metrics, process thinking, and executive mindset. "I know THAT," you say. And you do. Except that you probably can't explain how to supply those ingredients in as clear and useful a way as the authors do. 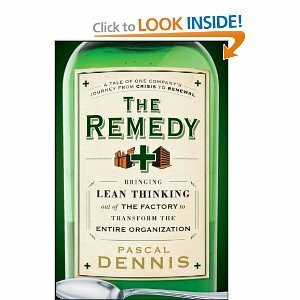 The book uses a combination of the fictional company and case examples of real companies to illustrate what they see as the way to avoid getting stuck in an improvement process that doesn't go anywhere. They also do a good job with diagrams and worksheets. The one they keep returning to is a statistical "improvement maturity" curve of companies. Michael and Brian say that most leaders overestimate their stage of excellence and provide a quick estimator tool. Michael will also be conducting a workshop on the five ingredients at the AME conference on Nov 15. I apologize to everyone for giving short shrift to their work. Maybe readers can round out my comments with their own.